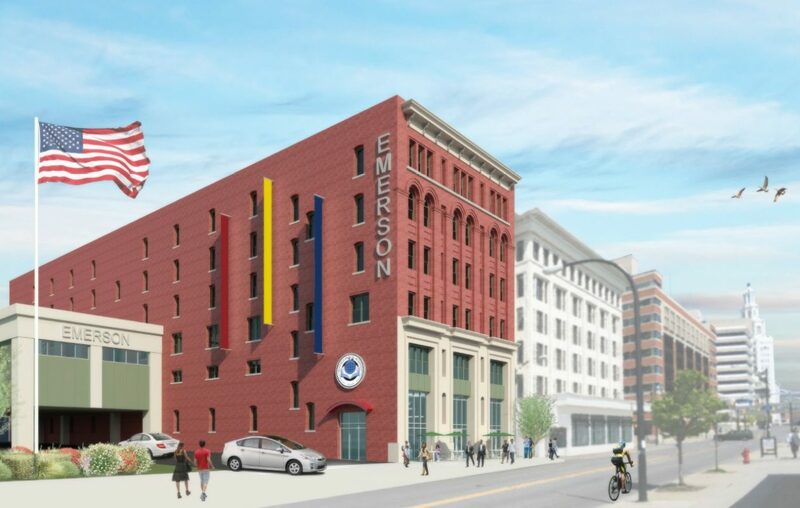 Rendering of the exterior of the proposed Emerson School of Hospitality to be built around the corner from the existing school. The development team behind the second location for the Emerson School of Hospitality is now finalizing lease negotiations and hopes to begin construction soon at a former livery stable on West Huron Street. 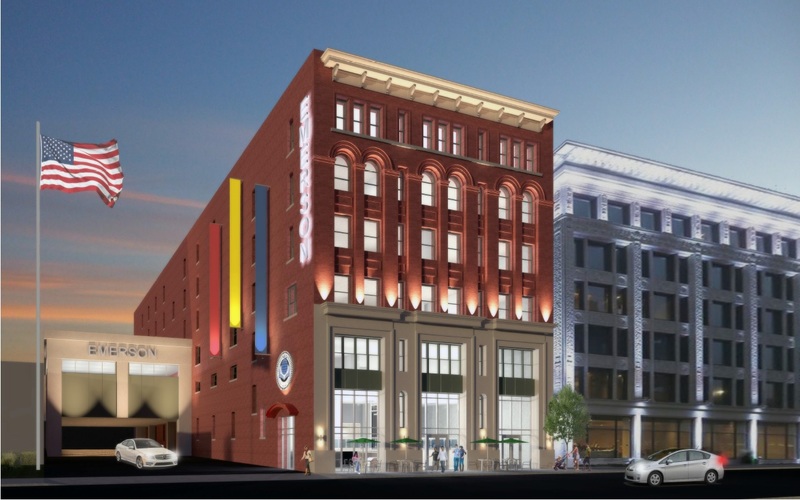 The Buffalo School Board formally awarded the project to McGuire Development Co. and Mark Croce's Buffalo Development Co., ending an unusually visible battle that had attracted many of the city's biggest real estate players. The developers plan to convert the former C.W. Miller Livery Stable at 73 W. Huron into a new urban school campus that will be linked to Croce's nearby Curtiss Hotel. "We are pleased that the school board finally approved the project," McGuire Development President James Dentinger said. "We really put a lot of effort into this. It was really a merit-based award that we received here, which was really great for everybody, especially the students." The anticipated action followed a recommendation for designated-developer status that was made in May by Superintendent Kriner Cash. At the time, the board held off on its own decision, however, because it wanted more time to review all the bids. Rival developers were making feverish public efforts to position their own proposals as superior. The unanimous 7-0 vote clears the way for McGuire and Croce to move forward on their $30.45 million project. Nevertheless, the city's delay in giving final approval to the two co-developers means the new downtown culinary school may not open until several months after the original desired timeframe. So instead of being ready by September 2018, it may not be completed until December of that year or even January 2019. That means new students destined for the new expansion site would likely be in the existing location until then. "We're not giving up on the date but it will be a really tight timeframe right now," Dentinger said Friday. McGuire and Croce will redevelop the historic six-story former horse stable building into an 80,000-square-foot culinary school, complementing the existing Emerson School building to create a city campus near public transportation. The building will include a public restaurant space, a private dining room, banquet and special-event space, kitchens, a bakery, food preparation and serving space, freight service elevators, and distribution space for supplies, as well as standard classrooms, lockers and a gymnasium. The new program also adds hospitality and hotel management to Emerson's existing offerings. The project, designed by Kideney Architects, is also up for a $750,000 low-interest loan from the Buffalo Building Re-use Project fund, pending underwriting and final approval by the Buffalo Urban Development Corp.
Dentinger said school board members visited both the new school location and the Curtiss in the past week "to get a sense of the neighborhood," and "were extremely impressed with the quality" of Croce's newly opened high-end hotel. "It's going to be a great project," Dentinger said. "It's about the hospitality campus, not just the culinary school. We're really excited about the connectivity of the two campuses." After the bitterly fought battle, one rival development team acknowledged its disappointment, but issued a conciliatory statement. "While the Uniland-Signature team believes it submitted a superior proposal on many levels and would have liked to have been chosen, we understand this project is about the students," said Jill Pawlik, spokeswoman for Uniland Development Co., which had partnered with Rocco Termini's Signature Development Co.
"We applaud the school district for investing in its students and we hope the new school will be as successful as the current one. We believe that a strong school district contributes to the economic renaissance of Buffalo, thereby providing its graduates with opportunities to live, work and raise families here."